After 7 days of pilgrim experience visiting many sites in Israel and Palestinian Territory, I finally get myself the Ultimate Dead Sea Experience from Jordan Side. The one experience I would never forget. Talking about the dead sea is a bit challenging due to so many good writings about it already. But I will try to share what I said to be my Ultimate Dead Sea Experience, my own personal thoughts. From the last post exploring Via Dolorosa, Jerusalem Old City, and Garden Tomb, we ended our visit to Israel after we had lunch at the Mount of Temptation restaurant in Jericho. A pretty famous restaurant for tourists, when we eat here there were a lot of tour buses. But this place is quite nice with the little garden outside. This restaurant serves international buffet food. They claim that they are able to accommodate up to 1,500 guests and the largest international food buffet in Holy Land. With more than 30 items, their specialty are the lamb chop and kenaffe (Arabian sweet). With this, we had a goodbye to Mr. Dani (our guide) and Mr. Abraham (our bus driver), thank you for your services, sir! From the Israeli side, we’re crossing the border again through the same border crossing, the King Hussein border through Jordan. It’s pretty much the same experience when we’re crossing the border from Jordan, except it seems just easier with the security issues. Not as intense as entering Israel. However, we still experiencing some problem with our baggage. Upon arrival, there’s some porter carrying a huge trolley or something like that, to pick our cases. Those porters told us to carry our hand carry bags, backpacks, small case with us. But this one Israeli woman at the small post before the entrance door seems like disagree. She kept telling us to put our bags there with the porter. And she did it not with a nice attitude. In fact, get used to it, I guess this is the kind of service you will get from ‘them’, agreed or not, that’s all you’ll get. All those words are thrown in a very unfriendly way. I don’t know if they’re trained that way, but it is what it is. Some from our group manage to carry their backpack inside with them, but the others whom I walked together with, are not that lucky. I tried to ignore the attitude, it’s blazing hot like super hot outside, maybe she’s just getting so emotional because of the heat. I don’t know. Once we pass through the immigration, some of us take care of tax refund for things that we shop in Israel. I got more than USD 100 in the tax refund from all my receipts. You should keep those receipts if you’re shopping in foreign countries, basic knowledge for travelers. Learn more about VAT refund in Israel. Did you know that Israel doesn’t stamp your passport instead they give you a small piece of paper? They did it because you can’t travel to some middle eastern countries if you have an Israeli stamp on your passport, and some will make it difficult. Israel is controversial. Finally, we’re back in Jordan. Only our bus driver picked us up this time, while Mr. Mahdi (our Jordanian guide from the beginning of our arrival in Jordan) waiting for us at the immigration borders office. Once everything is taken care of, there Mr. Mahdi say hello again on the bus. Quite a pleasant voice to hear, with a unique accent trying to speak our native Indonesian language. From the border, we’re going straight to see Mt. Nebo. A mountain where Moses once has given the sight of the Promised land before he died. The journey took us 2 hours. We had one Jordanian military police going with us inside the bus. They said it’s for some security reasons, I don’t know. But he looks badass and cool, though. Too bad I got no photo of him. Mt. Nebo approximately 817 meters above sea level. This place is strongly connected with Moses the prophet. Moses is a significant prophet for both Christians and Islam as well. And this is where he was granted one last view of the promised land. As written in the Book of Deuteronomy, Moses go to Mount Nebo to view the Land of Israel. He’s told that he would not enter the Promised Land and to die there. Moses buried in an unknown valley location in Moab. This is what Moses saw before his death. On a clear day, we can see the panorama of The Dead Sea, the Jordan River valley, Jericho, Bethlehem and the distant hills of Jerusalem. It’s so wide open and clear. If only not for the strong sun directly to our eyes, it will be more pleasant to stay for a while. Too hot and too bright for our eyes. We’re just not get used to it. A short brief about Mt. Nebo from Mr. Mahdi at this viewing point, there’s a board contains information about Mt. Nebo itself. The wind however is not friendly at all. I can feel it’s not just the wind but also with some dust or particles blowing hard make it even more difficult to enjoy this viewing point longer. In 1930s, a Byzantine basilica ruins uncovered by archeologists which nowadays stand as The Memorial Church of Moses. We didn’t go to see what’s inside although we wanted to. There’s a renovation going from 2007 to 2016, which just reopened on 15 October 2016. So yeah, the place was closed. But here’s how it looks from outside. From Mt. Nebo we’re going directly to what I’ve been expecting so much, The dead sea. I gave this post a title of my ultimate dead sea experience because I like it so much. Love the ambiance chilling at The Dead Sea. Our bus seems to have a bit of problem, the gas tank was leaking. We can smell a diesel fuel quite intense even inside the bus. Our driver gives a call to the company but seems like there’s no way to wait for assistance, so we proceed with caution. We’re staying at this nice hotel, Holiday Inn Resort – Dead Sea Jordan side. Amazing hotel with superb location and awesome facilities. This resort located right at the coast line of The Dead Sea. Why Is It Named Dead Sea? Before anything else, you probably wonder why is it called The Dead Sea? I used to think because it’s so dangerous and many deaths happened there so it is called The Dead Sea. Well, partially correct. This sea is extremely salty, like really salty. We all know that sea contains salt, one of minerals human used for many purposes. But due to the extreme level of saltiness, no life can afford to exist in this environment. By life, I mean marine inhabitation. The Dead Sea (34.2%) is not the saltiest bodies of water on earth, in fact, there are some places entitled so. Such as Lake Vanda in Antartica (35%), Don Juan Pond (44%), and more places that reported as world’s saltiest water. The Dead Sea surface and shores are 429 meters below sea level, making it the earth’s lowest elevation on land. Because it’s the lowest point on earth, there’s nowhere to go from here. The term for that is endorheic, means no outlet streams. The Jordan River is the only major source. For thousands of years, The Dead Sea has attracted so many visitors. It was one of the world’s first health resort and it’s minerals extracted for a wide variety of products. From beauty products to fertilizer. A rich resource indeed. You cannot swim here, please take a note. If you try to swim, you might be drowned. The water density is 1.24 kg/liter, which makes swimming more like floating. Yes, it’s called floating here, not swimming. 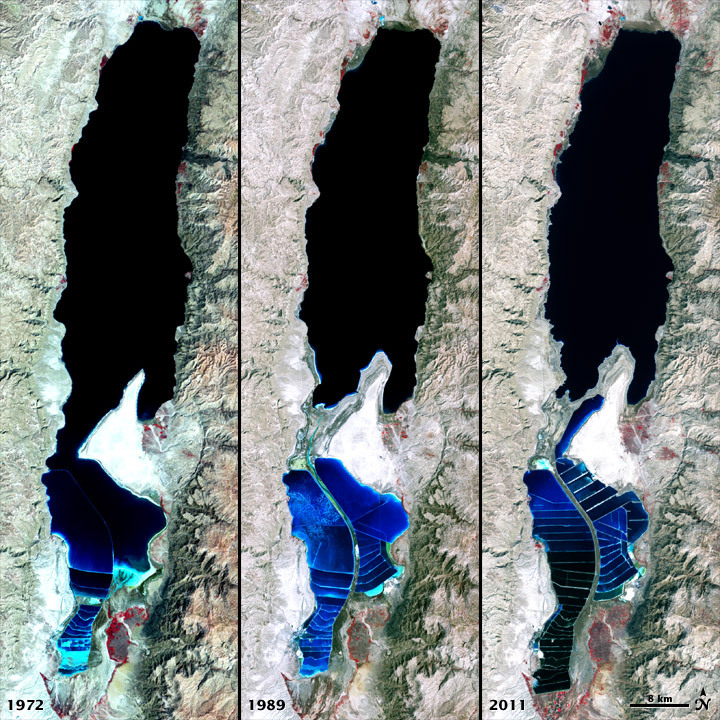 In recent years, the Dead Sea is shrinking at a very alarming rate. From a water surface of 395 m below sea level in 1970, it fell 22 m to 418 m below sea level in 2006, reaching a drop rate of 1 m (3 ft) per year. As the water level decreases, it might affect the characteristics of the Sea and surrounding. Due to man-made reduction of Jordan River water. All the shallow waters at the southern end of The Dead Sea are drained and now salt flats. The Red Sea–Dead Sea Canal project, carried out by Jordan, will provide water to neighboring countries, while the brine will be carried to the Dead Sea to help stabilize its levels. The first phase of the project is scheduled to begin in 2018 and be completed in 2021. An image to show the shrinking of Dead Sea from Wikipedia. The climate here mostly sunny with a little bit of rain during winter, if at all. The temperature ranging from 30°C in the spring to upwards of 40°C in the summer. When I arrived here it’s almost sunset, so it’s not that hot, but still I can feel the warm temperature even at night. When it comes to the morning after the sun comes out, I don’t think I can stand the heat as a human anymore. But! Although the Dead Sea is very sunny, the low altitude and extra atmosphere make the sunlight weaker. This quality of the Dead Sea sunlight is the real secret behind its mythological curing ability for several diseases, especially skin diseases. This is a natural phototherapy, so they said. As I mention earlier, I stayed at Holiday Inn Resort. It took us more than 1 hour to arrived at this resort. A resort that I would love to stay again definitely. It’s just this thing going with a group, you know. You can’t expect more in terms of spare time. We arrived pretty late, 5 pm something. And the access to ‘float’ at the Dead Sea closed by 6. Some of us can’t hold it any longer, they just went to enjoy floating right after we’re done checking in. Even with only 5 – 10 minutes left before 6 pm. But I chose to just take a walk around the resort, enjoying this beautiful view with such a breathtaking color cast in the sky. Such a perfect moment for taking a panorama photo. These panoramas are stitched in the post processing, I’m sorry for the flaw here and there in the images. I should’ve taken better images, if not in a hurry due to the battery. I might get better images. But this is just to give you the idea of what it looks like sunset by the Dead Sea. A lot of gazebos at the beach, perfect to enjoy the view of The Dead Sea and the breeze that will calm your soul. 🙂 They provide you with towels before entering the beach. You just have to provide your room number, just like usual. I did have a great time walking around during sunset on the beach, it’s one relaxing therapy-like moment for me. Dramatic to the max! Lol. We had a dinner buffet which I didn’t get any photo because it’s just so good that I just thinking about eating this eating that. You don’t need pictures, just believe me, it’s that good. The lambs, the beef, the desserts, fresh fruits, all of those 5-stars buffet as you expected from this kind of resort. I think I ate enough food for 2 days. The next morning, the sun rise pretty early. I remember waking up at 6, it already looked like the picture above. I missed the sunrise, but it’s okay. Guess that I need more sleep rather than I need sunrise. It’s been an extremely exhausting trip after days of lack of proper sleep. I met a local Jordanian, a hotel staff who works at the entrance of the beach to hand towels to hotel guests as well as reminding guests for some safety tips to swim at the Dead Sea. We had a little chat about how lovely the Dead Sea and the resort is. He also asked where do I come from, which he told me that he visited Indonesia once and he said that Indonesia is beautiful. He would love to visit again in the future. Don’t try to swim, just float. Trying to swim is useless. Don’t attempt to float stomach first. You will drown. Never let the water touch your lips, nose, or ears. It can cause extreme pain because it’s very salty. Be very careful with your eyes! Wear goggles, please. You cannot drink the water, it can cause you major dehydration. Just don’t. Recommended stay in the water less than 15 minutes, if you want to have more time, at least go to the shower once every 10 – 15 minutes to wash your whole body to avoid dizziness. Keep your eyes on your possessions, always be careful. Thefts are possible. Don’t bother to carry the mud from the sea, it will be spoiled without being processed. If you want the mud, buy the Dead Sea products. I spent 30 minutes floating before I’m done with it, with a shower in between 10 minutes. Of course, I also enjoy the mud. Those magical healing power from the Dead Sea minerals that according to many is good for your skin. I rubbed my entire body with those mud. Some grease feels even after scrubbing helps to feel fresh on your skin. Some popular things to do while you’re enjoying the Dead Sea like reading a newspaper while floating, applying mud to your skin, playing around with the sands, just don’t forget your camera. Because The Dead Sea is like a barrier border between three different territories, so you can enjoy The Dead Sea from three sides. Israel side, Jordan side, West Bank side. Israel side and Jordan side are the two accessible place for tourists since the west bank (Palestinian Territory) has restricted access from Israeli authorities. For the West Bank side, I don’t find any recommended stay. However, usually tourists or traveler visit the Qumran Shop where there is a Qumran Scroll visitor center. A place to watch a short movie about the scroll and sight seeing the Dead Sea scrolls. Usually done after lunch and shopping at Qumran shop. I myself bought some Dead Sea products from AHAVA and SEACRET. You can see the Dead Sea from here, Qumran Visitor Center. Although I want to spend as many times as possible to float, I still cannot bear the heat. Even though I used a sunblock lotion, it’s just too hot. And even I’m not floating, I can’t chill and relax at the beach because I must prepare for breakfast and check out from the hotel for our one special destination, Petra. One of the seven wonders of the world. Maybe later someday I will travel back to the Dead Sea. Hopefully, it’s not gonna dried up yet. I will share my trip to Petra exclusively in my next post. Stay tuned! Until then, leave a comment below if you have something about The Dead Sea and don’t forget to subscribe.